A busy day for Buxton Heating today. All the installers were brought together to fit 39 Thermostatic Radiator Valves in a day in a Medical Practice. This time we were not installing a boiler in Haslemere or a hot water cylinder in Liphook. The installation had to be carried out as quickly as possible around the doctors and patients, and with the minimum of disruption. This included adapting and extending the pipework for the new valves which were both straight and angled. Some of the pipework refused to drain so Oliver and Sean geared up with an aqua vac and a long hose following around and tackling these more difficult radiators. 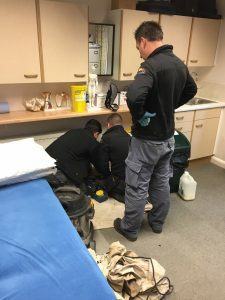 With the medical staff requiring quiet with their patients, they had to put the aqua vac outside the back door and use a long hose pipe to drain each radiator. A spot of lunch in the high street cafe and then re-filling the sealed system with all bleed keys in all sections the pressure held. The valves were changed as the existing ones were old and sticking, this caused several of the radiators to stop working. Always leave your thermostatic valves open during the summer months when the heating is turned off, this keeps the pins out rather than letting them get stuck in the valve bodies. For advice on all aspects of central heating in the Haslemere, Godalming, Guilford, Liphook, Midhurst areas contact Buxton Heating via the web page.